Much of the previous work conducted on adult stem cells has focused on mesenchymal stem cells (MSCs) collected from within the bone marrow. But as time goes by, newer and quicker met hods of cell collection have become the need of the hour. Scientists and doctors have been researching different therapy modules to show promising results for a wider range of diseases and disorders. Adipose tissue has proven to serve as an abundant, accessible and rich source of adult stem cells with multipotent properties suitable for tissue engineering and regenerative medical applications. There has been increased interest in Adipose-derived Stem Cells (ASCs) for clinical applications in cosmetology and degenerative disorders. Researchers were seeking an alternative to bone marrow for stem cell therapies because of the low number of stem cells available in marrow and also because harvesting them involves an invasive procedure. 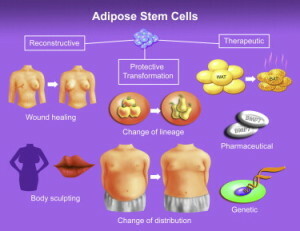 Adipose tissue is an interesting alternative since it contains approximately a 500-fold higher frequency of stem cells and tissue collection is simple. Adipose tissue is collected by needle biopsy or liposuction aspiration. Stem cells harvested from fat (adipose) are more potent than those collected from bone marrow in helping to modulate the body’s immune system. 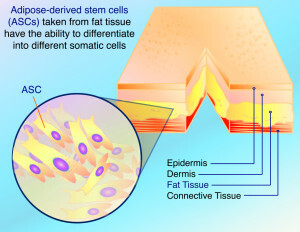 This finding is having significant implications in developing new stem-cell-based therapies, as adipose tissue-derived stem cells (AT-SCs) are far more plentiful in the body than those found in bone marrow and can be collected from waste material from liposuction procedures. Stem cells are considered potential therapies for a range of conditions, from enhancing skin graft survival to treating inflammatory bowel disease. 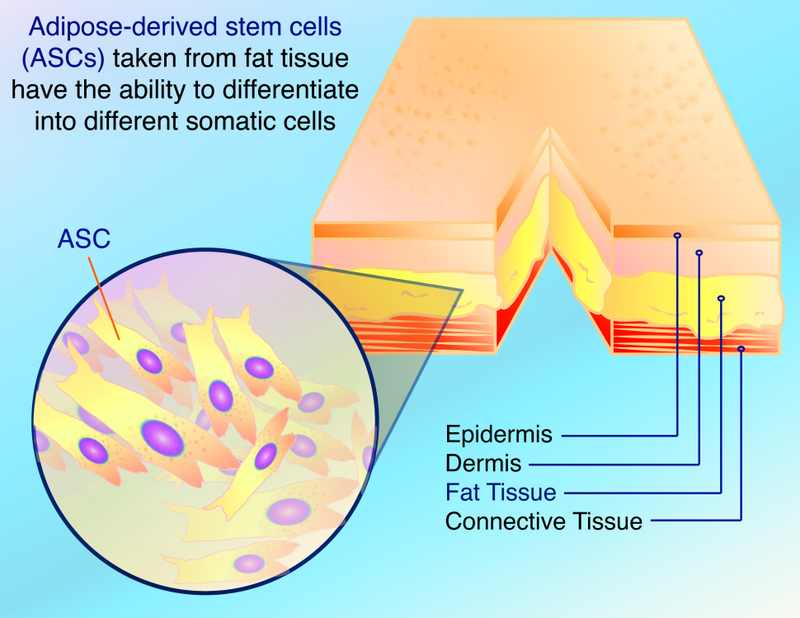 Adipose stem cells (ASCs) are an attractive and abundant stem cell source with therapeutic applicability in diverse fields for the repair and regeneration of acute and chronically damaged tissues. 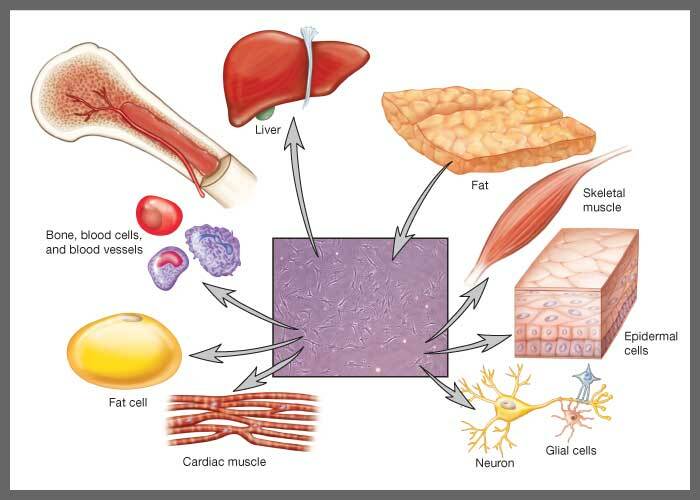 Importantly, unlike the human bone marrow stromal/stem stem cells (BMSCs) that are present at low frequency in the bone marrow, ASCs can be retrieved in high number from either liposuction aspirates or subcutaneous adipose tissue fragments and can easily be expanded in vitro. ASCs display properties similar to that observed in BMSCs and, upon induction, undergo at least osteogenic, chondrogenic, adipogenic and neurogenic, differentiation in vitro. Furthermore, ASCs have been shown to be immune-privileged, prevent severe graft-versus-host disease in vitro and in vivo and to be genetically stable in long-term culture. They have also proven applicability in other functions, such as providing hematopoietic support and gene transfer. Cosmetology has already undergone vast metamorphism with adipose stem cell based treatment options giving quicker and better results than other therapies currently available all over the world. If you would like to know more about how adipose derived stem cells can boost your health and improve your life, please contact us for more details.